SUNSURIA FORUM Setia Alam, an iconic landmark featuring three tower facade with a glazed surfaces. 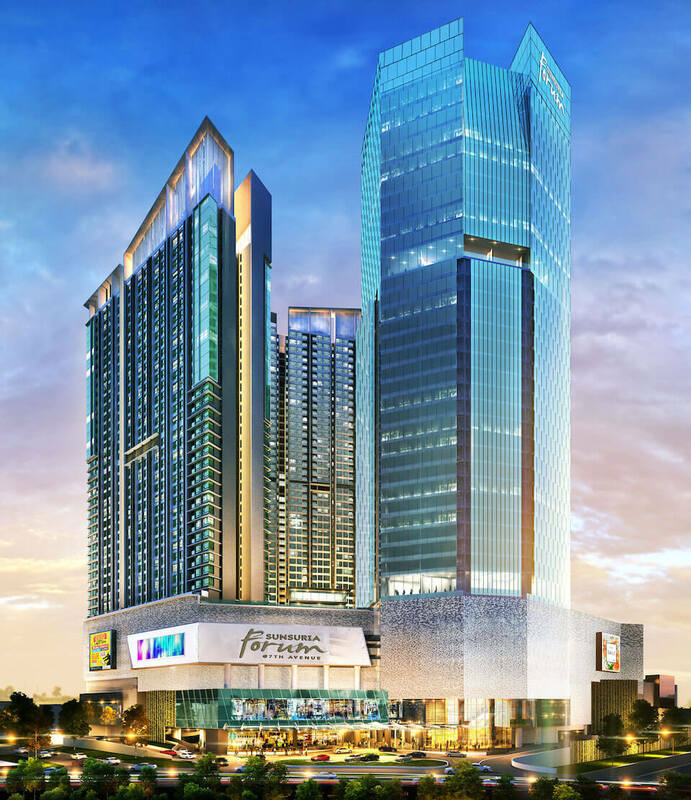 A FREEHOLD mixed integrated development by Sunsuria Bhd, in the 13.56 acres land, will be having street mall, retail outlets, corporate offices, residential towers themed Work, Live and Social. 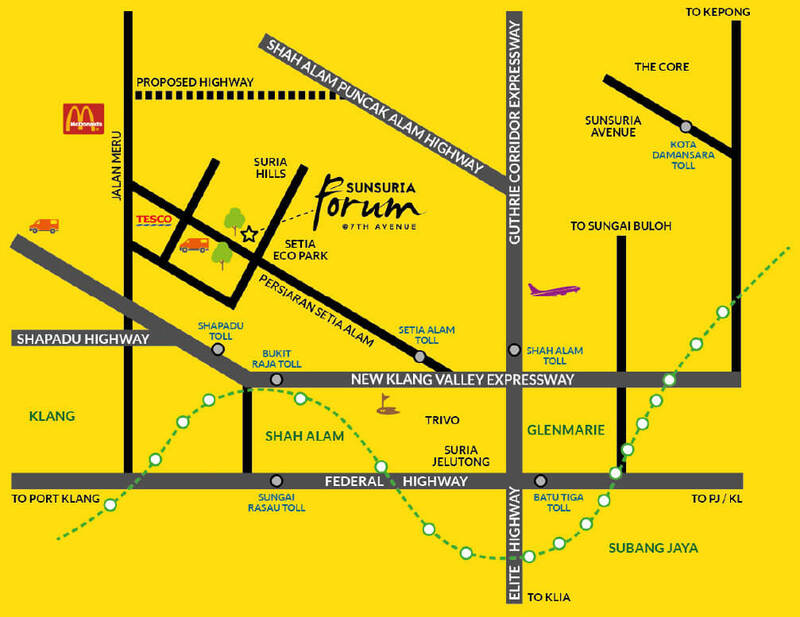 Sunsuria Forum @ 7th Avenue has a strategic location. Access can directly from Persiaran Setia Alam from Meru and just five minutes away from the Setia Alam toll. Situated within the international business zone, the project aspires to become a desired destination within Setia Alam by combining traditional shop offices with the lifestyle aspects of a shopping mall. Sunsuria Forum development divided into two phases: the first comprises a semi-enclosed street mall flanked by two-storey shop offices with separate small office suites located on the second level. The street mall will be occupied by the Village Grocer as anchor tenant and other famous chain stores such as Baskin Robbins, Secret Recipe, Hokkaido Cheese Tart, Focus Point and more. The shop offices and small offices under the first phase of the development are expected to be completed by Q2 2018. The second phase will feature a 256,000 sq ft lifestyle mall, with three towers of SoHo suites, corporate offices and residential suites sitting above the two-level mall. Occupants of the 33-storey SoHo suites and 31-storey corporate offices will get to enjoy a Stargazing view from the deck equipped with starlight pool, jacuzzi with creeper screening, plus lounge and shallow pool. Both towers are slated to be launched in Q2 2018. 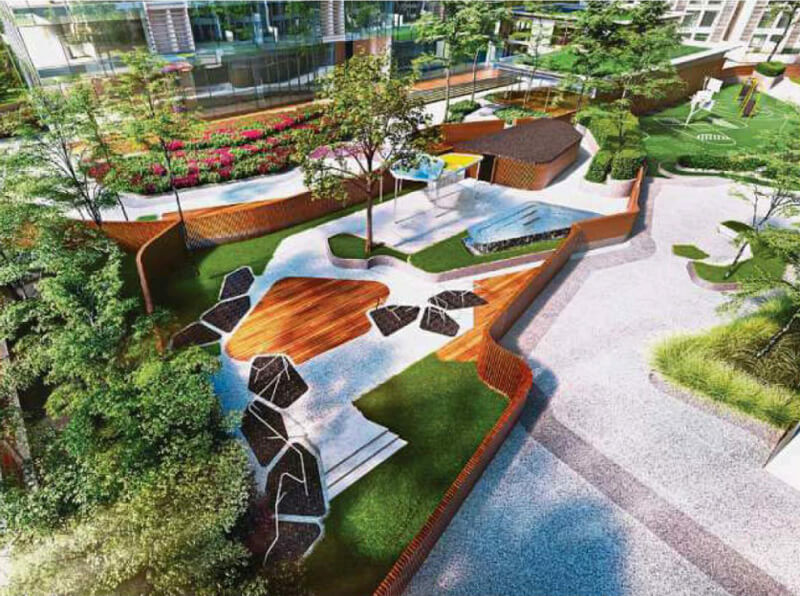 The residential suites boast a different set of amenities; residents get to experience a unique elevated sports lawn surrounded by a perimeter wall with a street workout system and a tri-basket shooting facility. The residents will also enjoy a 50m infinity lap pool equipped with jacuzzi, kids pool, together with a multi-purpose room suitable for any event or gathering. Linking the two phases is The Forum, the ‘heart’ of this development. As the name implies, this expanse will serve as a place to promote community sharing and interaction while the people enjoy a life-style of “eating and shopping”. 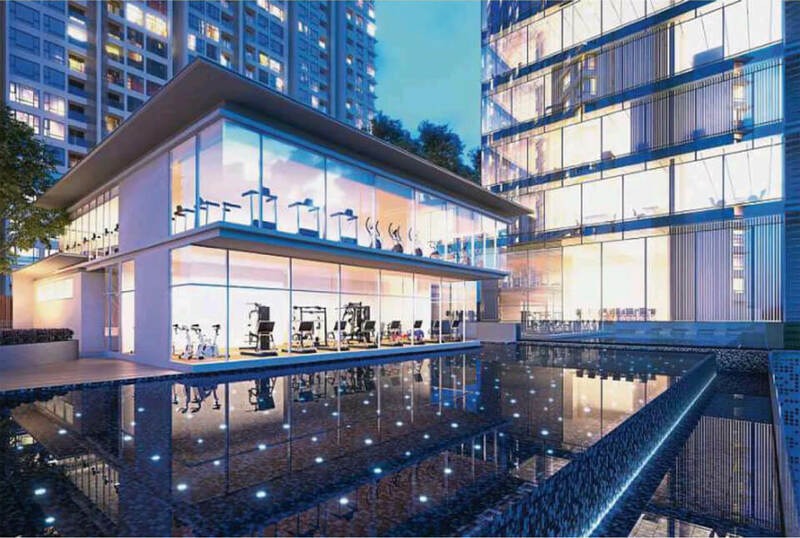 Exclusively available to occupants of the SoHo suites, corporate offices and residential suites, the 6,200 sq ft social hub comprises open spaces for community activity, BBQ area, as well as elderly station equipped with a yoga/tai-chi/pilates station, Nordic walk and diamond reflexology trails. The facilities of the three towers are all located on the same level. The mix of different indoor and outdoor retail experiences, office suites and residential components provides a balanced and sustainable development for the community. The development aims to foster a sense of freedom through space, interests and socialising that will be experienced by patrons as well as residents. For the Whole development to be interconnected, Sunsuria Forum has adopted a key design feature that integrates open corridors with elevated pedestrian walkways for shop offices. This enhances accessibility as well as interaction with the shopping are as. The seamless integration of all these components is the embodiment of living and working within a mixed development. For the safety of residents, a multi-tier security system will be implemented starting with clearly demarcated car parks. Residents are required to pass through a barrier gate that leads to their designated parking lots. This measure acts as a second level security to ensure that the area is only accessible to owners. As for commercial parking, a separate entrance caters for mall and retail shop patrons. The development will be equipped with a 24-hour surveillance system to give residents, visitors and workers peace of mind. At the same time, patrolling guards will cover the entire development perimeter at pre-defined schedules. MPropertyLaunch.com give the latest Malaysia properties projects. We gather the information from many available sources such as developers, newspaper, property agents etc.